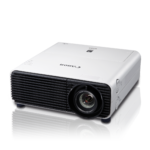 Ideal for medical education and training, the REALiS WUX450ST D Pro AV Short Throw Compact Installation Projector combines native WUXGA resolution (1920 x 1200), 4500 lumens of brightness, and Canon's LCOS technology with AISYS-enhancement to project bright, highly-detailed/contrasted and colour accurate images - all in a compact size (only 13.9 lbs.). The REALiS WUX450ST D's 1.35x optical zoom, short throw ratio of 0.56:1 and 0-75% vertical lens shift help provide exceptional installation flexibility, as does the models HDBaseT™ receiver which allows uncompressed HD video, audio and control signals to be transmitted over one single LAN cable up to a maximum distance of 328ft (100m). The WUX450ST D offers a DICOM Simulation Mode (Blue Base and Clear Base colour temperature settings) that can reproduce medical images such as X-rays, CAT scans and MRIs for non-diagnostic purposes. By optimizing the gradation and luminance of grayscale images, subtle details and variations can be clearly identified for valuable learning opportunities. 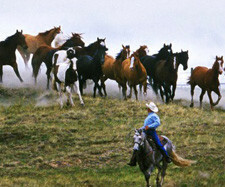 For added flexibility, it also provides a Picture by Picture mode to accommodate a variety of teaching styles. In Picture by Picture mode, one input can be set to show in DICOM Simulation Mode while the other is in a different mode allowing for a variety of display options. The WUX450ST D delivers exceptional image quality thanks to its WUXGA (1920 x 1200) high-resolution and a combination of core advanced optical and image processing technologies including a Genuine Canon Lens, Canon's LCOS Technology with AISYS-enhancement, and an advanced Colour Management system. In addition to the projectors small form factor (13.9 lbs. ), 0.56:1 short throw ratio, impressive 0-75% vertical lens shift, and HDBaseT™ compatibility, the WUX450ST D features a variety of other advanced optional settings to further maximize installation versatility including 4-Point Keystone Correction which allows the corners of the image to be independently adjusted to help ensure optimal image reproduction, and Built-in Edge Blending which enables the projection of one seamless, large image from multiple projectors without the need of special software. The REALiS WUX450ST D offers multiple industry-standard interfaces including HDMI®, DVI-I, USB, RS-232C, and an RJ-45 network port which supports gigabit data transfer speeds. In addition, it also supports WiFi which can be used to enhance the WUX450ST D's Network Multi Projection (NMPJ) functionality which allows a projector(s) to receive display information from a PC(s) through a network. This model is a Crestron Connected device, compatible with AMX Device Discovery, and also supports PJLink™ which makes it possible to control and monitor the projector over the network - a feature well suited for observing lamp hours, usage and more. 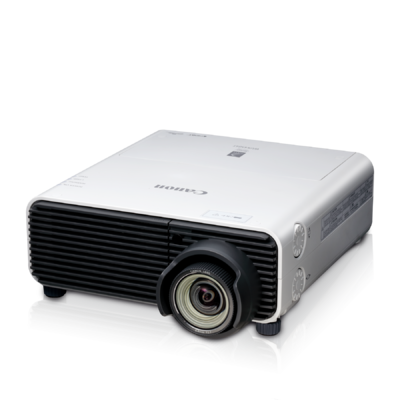 The REALiS WUX450ST D is backed by the Canon Three-Year Projector and Lamp Limited Warranty (120-day lamp coverage), and the Company's award-winning Professional Service & Support.